Google Docs Spreadsheets is a free online app that creates spreadsheets which can be shared with other people. All that is required to use Google Sheets is a web browser on any operating system. If you are familiar with Microsoft Excel or Apple Numbers, you will be comfortable with Google Docs Spreadsheets. Unlike Microsoft Excel or Apple Numbers, Google Docs Spreadsheets offers a wide array of financial functions such as current prices, fundamental stock data, and mutual fund performance. The financial functions can be embedded in a Google Docs Spreadsheet to provide nearly real time updates. For more information see the Google docs finance help page. Click on the spreadsheet above for sample Google Docs spreadsheets to monitor your portfolio. U.S. Equity Component. Here is how the asset allocation breaks down by size and style (growth, neutral, and value) for the US equity component. 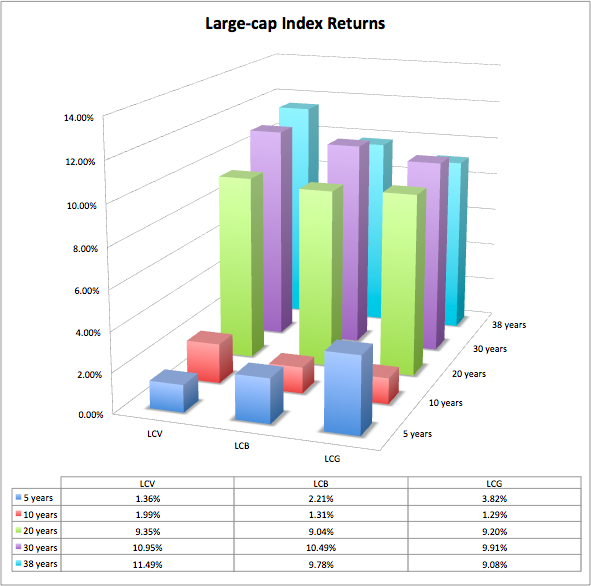 The market capitalization is: large cap 33%, mid-cap 33%, and small cap 33%. The style weightings: value 41%, neutral or blend 36%, and growth 22%. Thus, the U.S. equity component leans toward value with weighting equally distributed between market caps. International Component. The international stocks have a larg-cap, value bias. They include: large cap 72%, mid-cap 19%, and small cap 7%. The styles are: value 41%, neutral or blend 29%, and growth 28%. Using Vanguard data, the geographic coverage of the international component is Europe 51.1%, Asia, 25.9%, Emerging Markets 34.1%, and North America 6.2%. Morningstar X-ray shows the geographic coverage as: U.S. & Canada 4.16%, Europe 42.23%, Japan 13.24%, Latin America 7.07%, and Asia & Australia 26.32%. In an asset allocation portfolio, do value stocks outperform growth stocks? Do small-cap stocks outperform large-cap stocks? The answer to both questions is yes, for most periods. The two graphs are based on data contained in the Backtesting Portfolio Spreadsheet prepared by a member of the Bogleheads Forum. The spreadsheet provides returns for various asset class combinations for periods between 1972-2010. The charts compare returns for six asset classes over five different time periods ending December 31, 2010. For each period except the most recent 5-year period, large-cap value stocks outperformed large-cap growth stocks. Similar results can be seen for small-cap stocks. The two graphs also show that small-cap stocks outperformed large-cap stocks of the same type (i.e., value, blend, or growth) for all of the periods except one. The Backtesting Portfolio Spreadsheet prepared by a member of the Vanguard Diehards Forum has been updated to include data from 2010. The spreadsheet will back test various asset class combinations using actual returns from index funds from 1972-2010. This is a great resource for asset allocation analysis. Both Vanguard and Dimensional Fund Advisors offer quality index funds with low expense ratios which can be used to build an asset allocation portfolio. There has been a recurring debate over which family of index funds performs better. Using data from Google showing returns for comparable DFA and Vanguard funds, you can answer that question for yourself. The table below shows trailing one, three, and five-year returns, YTD return, and the expense ratios for Vanguard and DFA index funds in comparable asset classes. The fund offerings are not identical. Vanguard offers both U.S. mid-cap blend and U.S. mid-cap value funds, while DFA does not. Conversely, in the international emerging markets category, DFA offers large-cap value and small-cap funds, as wells as, a large-cap fund. DFA also offers a U.S. micro-cap fund, although it has underperformed both Vanguard and DFA’s small-cap blend funds. Vanguard has no corresponding micro-cap fund. According to the Google data, the trailing total returns for one, three and five years are fairly similar for Vanguard and DFA in each asset class. Looking at the data on the Vanguard and DFA websites, 10-year performance shows some differences with a slight advantage going to to DFA, particularly in the international asset classes. Here is a link to the same spreadsheet with some additional data, one and four week return and yield (dividends and distributed capital gains). If you have spent any time studying ETFs, you probably noticed that Ryder’s Equal Weight S&P 500 ETF (RSP) has consistently outperformed capitalization weighted indices based on the S&P 500 such as the SPDR S&P 500 ETF (SPY). However, there seems to be a relatively simple explanation for this. The S&P 500 index includes 500 of the most widely held U.S. companies. The index uses market capitalization to determine the relative weighting of its holdings. The largest companies dominate the index. For example, at the time of this writing, the top 10 holdings in the S&P 500 index accounted for 18.73% of the index. Equal weighting of the S&P 500 has the effect of changing its asset class mix from predominantly large-cap to a mixture of large and mid-cap stocks. Here are Morningstar x-ray views of SPY and RSP. SPY is 88% large-cap and 12% mid-cap. 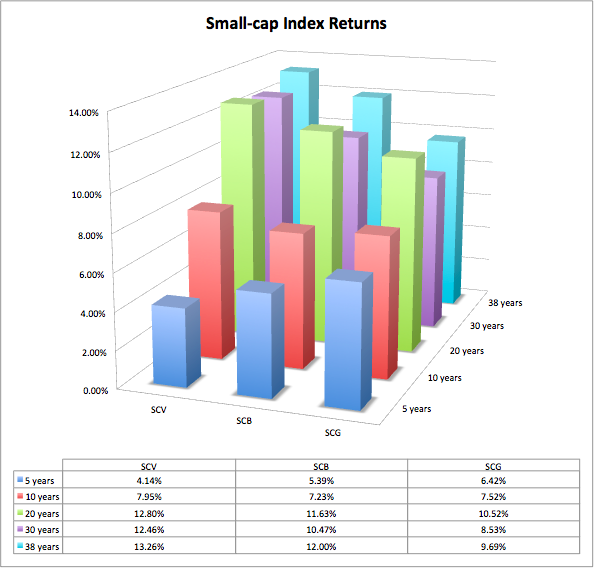 In contrast, RSP is 54% large-cap, 44% mid-cap, and 2% small-cap. RSP’s mid-cap weighting impacts performance. During periods when mid-cap stocks out perform large-cap stocks, RSP will out perform the S&P 500 index. There is no magic to RSP’s return. The equal weighting shifts the asset class composition of the ETF and according changes the total return. We have added two model portfolios built with funds from Dimensional Fund Advisors. Unfortunately, DFA funds are not available to individual investors and must be purchased through a financial advisor (which typically adds a 1% fee). However, DFA funds are often held up as the gold standard for asset class investing. DFA’s selection of securities in different asset classes is not constrained by the construction of the common indices, (e.g., the S&P, Russell, etc.). DFA’s asset class construction is based on sound academic research. DFA defines the criteria for each asset class. Thus, some of the DFA funds significantly outperform the commonly followed indices as well as competing funds in the same asset class. The important question is whether a portfolio of DFA funds outperforms a similarly constructed of widely available funds, after paying the financial advisor fee for the DFA funds. The model DFA portfolios here allow a head-to-head comparison. The DFA – FundAdvice Portfolio uses 10 mutual funds of various asset classes from DFA. The portfolio equally weights US and foreign equities. It includes large and and small capitalization stocks, value stocks, emerging markets, and U.S. REITs. This approach reduces volatility while increasing overall return. The portfolio is described at the FundAdvice website. It also appears in the book Live It Up Without Outliving Your Money! Getting the Most From Your Investments in Retirement by Paul Merriman. The DFA – Aggressive Portfolio uses 11 mutual funds of various classes from DFA. It includes US and foreign equities; large and and small capitalization stocks; neutral and value international stocks; emerging markets; and a U.S. REIT ETFs. This portfolio is based on the Index Fund Advisors (IFA) 100 Fund. It is their most aggressive all equity portfolio and has had the highest return of their 20 model portfolios. Two model ETF portfolios have been added. This portfolio started with $10,000 on December 31, 2010. It provides asset class diversification using 14 ETFs (8 Vanguard and 4 non-Vanguard ETFs). The portfolio includes an equal weighting of US and foreign equities; large, medium, and small capitalization stocks; and U.S. and international REIT ETFs. The portfolio has a value tilt. Vanguard ETFs offer particularly good value. It is mutual company (meaning it is member owned and has no shareholders) and its ETFs have low expense ratios. Unfortunately, Vanguard has some gaps in its coverage of international ETFs. So this model portfolio has included 4 non-Vanguard ETFs. Under Vanguard’s new ETF pricing, the total cost for setting up this portfolio would be $28, (4x$7) in commissions for the non-Vanguard IRAs, and an annual brokerage account fee of $20. The use of ETFs allows broad diversification with a relatively small amount of money. Most index mutual funds have a $3,000 minimum cash requirement. This ETF portfolio also started with $10,000 on December 31, 2010. It consists of five Vanguard funds. It achieves simple but good asset allocation with equal weight of US and foreign equities. It includes large and small cap stocks with a value bias and a US REIT ETF. Under Vanguard’s new ETF pricing, there would be no commission charges for setting up this portfolio since all of the ETFs belong to Vanguard. There would be an annual brokerage account fee of $20. Both portfolios are updated daily on Stockherd.com and can be viewed using the links on the menu bar. Here are some of the ETFs that we will discuss at our meeting on Wednesday. The question is whether we should park our cash in an ETF, and if so, which of these ETFs, or combination of two ETFs, should we use.